One of the American professional basketball player is Draymond Jamal Green Sr. who is famous as Draymond Green. He plays as the power forward for the Golden State Warriors of the National Basketball Association. He was named in the NBA All-Defensive Team and won the first NBA Championship in 2015. 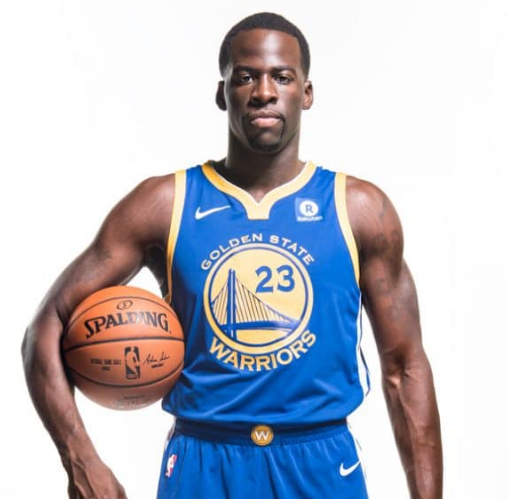 Draymond Green’s full name is Draymond Jamal Green Sr. He was born on 4 march 1990 at Saginaw, Michigan. His father name is Wallace Davis and mother name is Mary Babers. He has two brothers named as Torrian Harris and Braylon Green. He also has three sisters named as LaToya Barbers, Jordan Davis and Gabby Davis. He attended Saginaw High School. He played college basketball for Michigan State. Draymond Green’s height is 2.01 m and weight is 104 kg. His eye color is black and hair color is also black. He has the balanced and healthy body. Draymond Green played for coach Lou Dawkins in Saginaw High School. In 2005-2006, as a sophomore he averaged 12 points and 11 rebounds per game. In 2006-2007, as a junior he averaged 25 points, 13 rebounds, three assists and three steals per game. He signed a National Letter of Intent to play college basketball for Michigan State in 14 November, 2007. In 2007-2008, as a senior he averaged 20 points, 13 rebounds and two blocked shots per game. He was named captain for the Detroit Free Press All-State Dream Team. He was rated no. 36 player in ESPN 150. Also he was included as no. 13 in power forward. In 2008-2009, as a freshman year he averaged 3.3 points and 3.3 rebounds per game of the Spartan bench. In 2009-2010, as a Sophomore year he appeared in 37 games with three starting assignments as he averaged 9.9 points, 7.7 rebounds, 3.0 assists and 1.2 steals per game. He was named in Big Ten Sixth Man of the Year. He has seven games with double-doubles including 17 points and 16 rebounds against Illinois on 6 February. In 2010-2011, as a junior year he averaged 12.6 points and 8.6 rebounds per game. He recorded his first and second triple-double of the season. He earned third-team All-Big Ten honors for second straight year. In 2011-2014, as a senior year he captained the Spartans. He was named in Big Ten Men’s Basketball Player of the Week four times during the season. He was also named as Big Ten Player of the Year. He recorded his third triple-double in second round of 2012 NCAA Tournament. He made 1000 points and 1000 rebounds in his career and ended as one of the three players in Michigan State history. In 2012-2013 season, he was selected in 2012 NBA draft by the Golden State Warriors. He signed three-year contract on 30 July,2012. On October he made his debut. He was in the first round of 2013 NBA Playoffs on 20 April. He ended the season with the series 4 games to 2 and playoff run. In 2013-2015 season, he lost 20 pounds a showed improvement. He recorded a career high 20 points and career high tying 12 rebounds off. He finished 2013-2014 season playing 82 games with 12 starts. He earned praise for his tough defense. In 2014-2015 he promoted to the starting lineup. He recorded his first career triple-double with 16 points, 11 rebounds and 13 assists on 2 January 2015 by which he became the sixth player in NBA history to record a triple-double in NBA Finals. He was the finish runner-up to Defensive Player of the Year Award and Most Improved Player Award. In 2015-2016, he resigned with warrior to five-year contract. he became the first player after Nicolas Batum to record five or more an all five major statistical categories. He was named in the Western Conference All-Star Reserve for 2016 NBA All-Star Game. He was selected to the All-NBA Second Team. In 2016-2017, he helped the warriors start the season. He was named a Western Conference All-Star Reserve for 2017 NBA All-Star Game. He became the first player to make 150 steals and 100 blocks in the season. He made triple- double which is nineteenth of his career and fifth of the season. he was in NBA 2017 finals and was named as NBA Defensive Player of the Year who became the first Warrior player in history to earn the award. In 2017-2018, he opened the season game in 17 October 2017. Ha made his career 20th triple-double. He became the third player in Warrior to reach 800 playoff rebounds. He was in the 2018 NBA Finals by beating Rockets by 101-92. He passed Chamberlain the most rebounds in Warriors playoff history. The warriors went to sweep series against Cavaliers to claim back-to-back titles. At 2011 he represented United States national team in Summer Universiade men’s basketball tournament in Shenzhen. He was named in United States squad for the 2016 Summer Olympics. Green was in relationship with Jelissa Hardy. They had been together since high school days. They were even referring to marry. They have two children together named as Kyla and Draymond. However, they got separated in 2017. It was rumored that he is in relationship with Hazel Renee who is an actress. Draymond Green’s net worth is estimated to be $16.4 million.